Phoenix, Arizona has one of the top residential growth markets in the nation as Phoenix experiences regular population annual growth of 4%. With a constant rise in population it is no wonder that the city is one of the largest cities by population in the U.S. It is the largest state capital city by population in the nation. The Top 5 Phoenix Area Neighborhoods to live in for various reasons are Arcadia, North Tempe, North Central Phoenix, Verrado and Agritopia. Between these five neighborhoods, Phoenix has a little something for everyone, no matter what their lifestyle or taste. We have scoured the Internet and researched the best Arizona home warranty companies to provide you with the best list possible of home warranty companies. Hopefully saving you time and energy when considering where to purchase your next home warranty policy. While this is not a complete comprehensive list of providers, these are the top rated home warranty services in the Phoenix area. Phoenix has a unique climate, which means that homeowners have different needs than that of people living in Portland or Orlando. Phoenix’s dry hot weather leads homeowners and residents to run their air conditioners all year long. This means the life cycle of their ac unit is much shorter than that of those living in areas where seasons happen. With the constant increase of new residents from other areas it is no wonder that home warranties are a popular purchase by residents. Being able to outsource the repairs and maintenance of your new home in a new city can save you the time, energy, money and headaches of doing repairs yourself. Phoenix market trends indicate an increase of 5% in median home sales over the past year. The median home value in Phoenix is $220,200, 30% more than Tucson. Phoenix real estate market has risen 7% per square foot over the last year. Over a five-year period the median sales price for all residential properties in the Phoenix area has risen 60%. Realtor.com predicted that Phoenix real estate would be at the top of the charts for residential sales for all of 2017. Phoenix proper median home values and average price per square foot for residential is even higher than Phoenix area numbers report. This is definitely a sellers or investors market! If you are looking to buy you will be paying more per square foot than you were a year ago, so being patient for the right house to come around isn’t working out in your favor. Buy and consider that home values are increasing and do a renovation to make that home purchase your own. As realtor, Daniel Brown mentions in his video on the Phoenix area market status, when home prices are on the upswing it is a sellers market and buyers are competing to get the home they want. As the holidays approach there is a stagnation of new homes coming on the market, thus working in the homebuyers favor. When a home sits for longer than a seller prefers, they will make or add concessions to help get their home sold more quickly. Buyers can ask for sellers to cover closing fees and or ask to have a home warranty included in the purchase. Home warranties are a hot topic for residents in the Phoenix metro area; they are number one in the nation on buying interest in the home warranty provider market. Some key indicators that Phoenix homeowners are clued into the importance of home warranties is that interest in home warranties is more than double than that of warranties in Texas or Utah, both with similar climates. 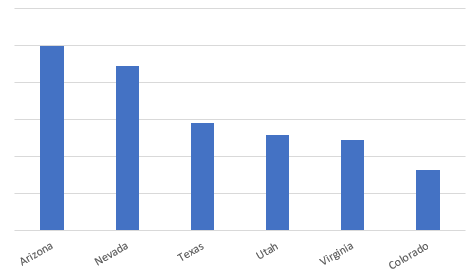 Home warranty interest is more than triple in Arizona than that of Colorado. 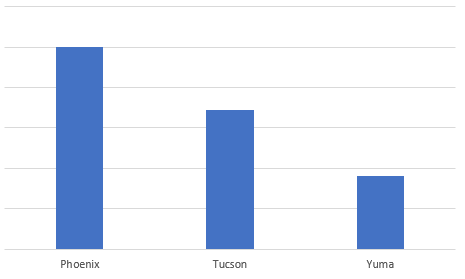 Phoenix has the highest level of interest in all of Arizona as well, much higher than Tucson or Yuma. Actually, Phoenix has the highest level of interest also compared to other big cities in southern states like Houston or Las Vegas. This is not a surprise, since house maintenance can be expensive in this area. home warranties are insurance policies to help keep residents on budget and relieve stress of handling repairs and maintenance issues on their own. What could explain Phoenix being so high on the list? Phoenix enjoys a sunny, dry and warm climate. In summer times temperature above 100 degrees is not uncommon. This kind of weather influences home systems and appliances. There are many home warranty providers that offer their services in Phoenix and the supply is relatively high, compared to other states. You can choose the right warranty for your home without overpaying. The fact that Phoenix is a huge metropolitan, makes it a perfect place for advertisers. Thus, the awareness for this service is higher than in other cities in the area. Phoenix has a higher than the national minimum requirement on minimum wage, with the minimum wage effective for January 2018 will be $10.50. This higher increase in wages provides for a robust economy where residents will spend their hard earned money keeping the cities economy growing. When residents buy into homeownership or even rent there is a very high level of interest in home warranties as a way to stay on budget and keep excess costs of repair and maintenance down when it comes to home systems and home appliances. *Please note – home warranties do not cover damage as a result of an Act of God (natural disasters).